Name Variation Elizabeth J. Davies was also known as Lizzie. Name Variation Elizabeth J. Davies was also known as Eliza M.
Married Name 25 November 1891 As of 25 November 1891,her married name was Sherwood. Elizabeth J. Davies was born on 25 May 1866 at Wisconsin. She was the daughter of David J. Davies and Mary T. Jones. Elizabeth J. Davies married Charles B. Sherwood, son of Malvin Sherwood and Mary L. Daley, on 25 November 1891 at Sauk, Wisconsin. 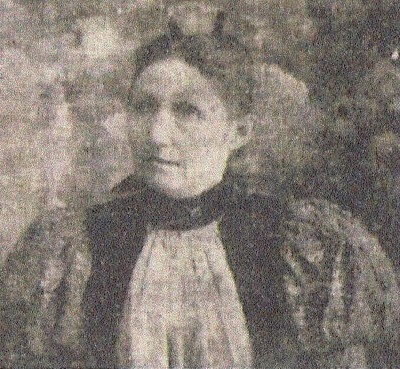 Elizabeth J. Davies had 2 with 1 living in 1900 children. She had 3 with 1 living in 1910 children. [S247] U.S. Federal Census 1870 U.S. Federal Census, by Ancestry.com, Dwelling 39. [S246] U.S. Federal Census 1880 U.S. Federal Census, by Ancestry.com, NA Film Number T9-1446 Page Number 236D. [S245] U.S. Federal Census 1900 U.S. Federal Census, by Ancestry.com, ED 145. Dwelling 27. Stamp 92. [S244] U.S. Federal Census 1910 U.S. Federal Census, by Ancestry.com, Sheet 13A. ED126. Dwelling 90. [S243] U.S. Federal Census 1920 U.S. Federal Census, by Ancestry.com, ED166. Dwelling 14. [S250] U.S. Federal Census 1930 U.S. Federal Census, by Ancestry.com, ED36-37. Dwelling 113. [S373] U.S. Federal Census 1940 U.S. Federal Census, by Ancestry.com, Year: 1940; Census Place: Ontario, San Bernardino, California; Roll: T627_290; Page: 1B; Enumeration District: 36-62. Raymond Russell Sherwood was born on 1 December 1892 at Wisconsin. He was the son of Charles B. Sherwood and Elizabeth J. Davies. Raymond Russell Sherwood married Ethel Belle Ellas, daughter of Stacy P. Ellas and Rosa Dell Rice, circa 1912. [S250] U.S. Federal Census 1930 U.S. Federal Census, by Ancestry.com, ED36-90. Dwelling 325. Name Variation Stella Nickey was also known as Estella. Stella Nickey was born in October 1880 at Wisconsin. Stella Nickey was a teacher. Isola M. Webster was born on 15 February 1884 at Wisconsin. She was the daughter of Jackson Ezekiel Webster and Isola Aitkins. Isola M. Webster died on 23 June 1977 at age 93. 1 June 1905 Soldiers Grove, Crawford, Wisconsin Isola M. Webster appeared on the census of 1 June 1905 in the household of Jackson Ezekiel Webster at Soldiers Grove, Crawford, Wisconsin. Thelma Jones was born on 1 July 1896 at Wisconsin. She was the daughter of George Meridith Jones and May Hill. Lyle G. Meade was born on 7 May 1912 at Wisconsin. Lyle G. Meade died on 20 November 1970 at age 58. Lyle G. Meade obtained US Social Security Card at Wisconsin; last residence not specified. Fern J. Meade was born circa September 1916 at Wisconsin. Fern J. Meade died before July 1999. Merlin Jones Meade was born on 19 July 1918 at Wisconsin. Merlin Jones Meade died on 24 February 1984 at Columbia, Wisconsin, at age 65. Merlin Jones Meade obtained US Social Security Card at Wisconsin; last residence Lodi, Columbia, Wisconsin. Name Variation Abraham Nickey was also known as Abram. Abraham Nickey was born circa 1825 at Pennsylvania. He was the son of (?) Nickey. Abraham Nickey married Margareta Eve Kiefer, daughter of George Philip Keifer and Eva Marcia Roedel, on 3 December 1846 at Richland, Ohio. 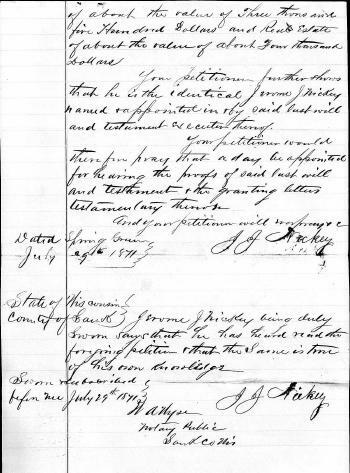 Abraham Nickey witnessed the probate of the estate of Jacob Kiefer on 26 October 1860 at Sauk, Wisconsin; Probate of Jacob Kifer (Kiefer) - appraised by Simon Spyker, Abraham Nickey. Abraham Nickey died on 20 July 1871. His estate was probated on 11 October 1872 at Sauk, Wisconsin. Section 28 Twp 12-N Range 3-E Meridian 4th PM - 1831 MN/WI Counties Sauk. Name Variation Margareta Eve Kiefer was also known as Margaret. Name Variation Margareta Eve Kiefer was also known as Keifer. Married Name 3 December 1846 As of 3 December 1846,her married name was Nickey. Margareta Eve Kiefer was born on 24 August 1825 at Pennsylvania. Margareta Eve Kiefer married Abraham Nickey, son of (?) Nickey, on 3 December 1846 at Richland, Ohio. 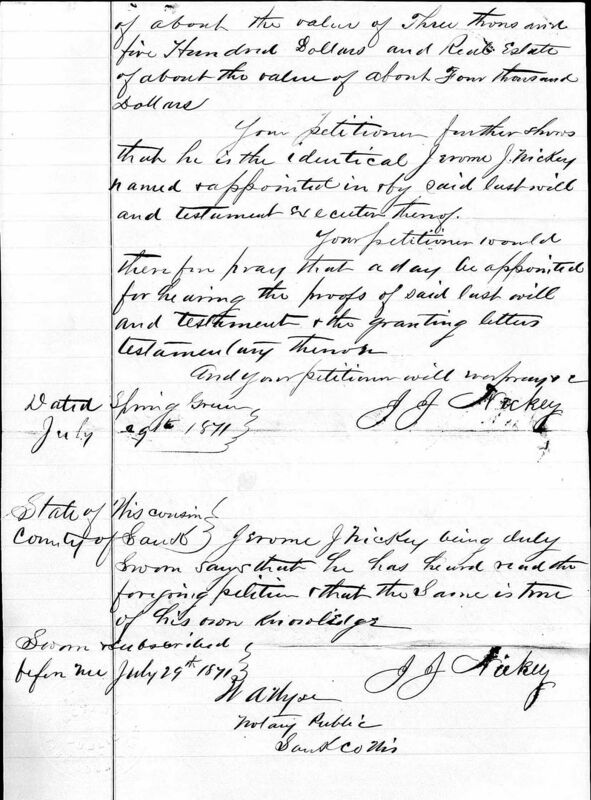 Margareta Eve Kiefer was listed as a beneficiary in Abraham Nickey's will on 11 October 1872 at Sauk, Wisconsin. Margareta Eve Kiefer died on 20 November 1907 at age 82 Margaret (Kiefer) Nickey obituary. 1 June 1905 Milwaukee, Milwaukee, Wisconsin Margareta Eve Kiefer appeared on the census of 1 June 1905 at Milwaukee, Milwaukee, Wisconsin. Margareta Eve Kiefer lived in 1889 at r. 234 18th., Milwaukee, Milwaukee, Wisconsin, listed as Widow of Abram. She lived in 1890 at 237 17th., Milwaukee, Milwaukee, Wisconsin, listed as Widow of Abraham. She had 11 with 5 living in 1900 children. Thomas H. Nickey was born on 14 March 1863 twin with Francis F.
Thomas H. Nickey died on 19 March 1863. Francis F. Nickey was born on 14 March 1863 twin with Thomas H.
Francis F. Nickey died on 20 August 1864 at age 1. Mary E. Nickey was born circa December 1855 at Wisconsin. 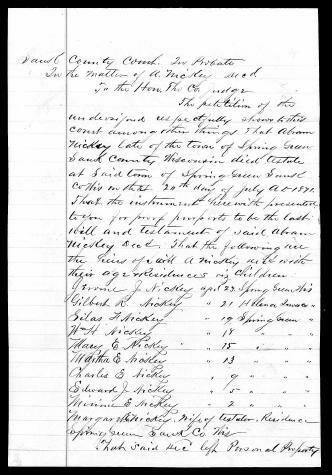 Mary E. Nickey was listed as a beneficiary in Abraham Nickey's will on 11 October 1872 at Sauk, Wisconsin. Mary E. Nickey died on 23 August 1875. Name Variation Martha Ella Nickey was also known as Ellen. Name Variation Martha Ella Nickey was also known as Ella. Martha Ella Nickey was born on 22 November 1857 at Wisconsin. 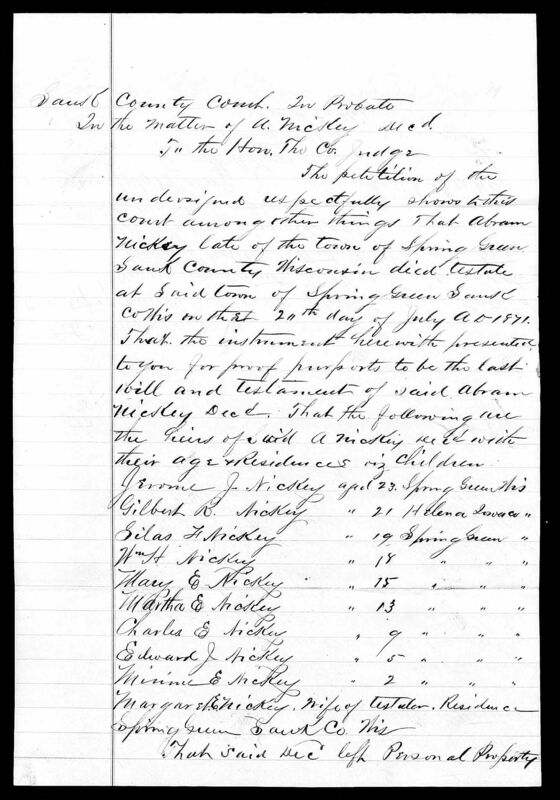 Martha Ella Nickey was listed as a beneficiary in Abraham Nickey's will on 11 October 1872 at Sauk, Wisconsin. As of 1910, Martha Ella Nickey was never married. She died on 9 March 1911 at age 53. 1 June 1905 Milwaukee, Milwaukee, Wisconsin Martha Ella Nickey is listed as daughter on the census of 1 June 1905 in the household of Margareta Eve Kiefer at Milwaukee, Milwaukee, Wisconsin. Name Variation Martha Ann Staley was also known as Mattie. Married Name 1 June 1897 As of 1 June 1897,her married name was Crotchett. Martha Ann Staley was born on 12 March 1862 at Wythe, Virginia. She was the daughter of John Alexander Staley and Anna B. Hagy. Martha Ann Staley married William Henry Crotchett, son of Lorenzo Dow Crotchett and Elizabeth Christian Tanner, on 1 June 1897 at Wythe, Virginia. Martha Ann Staley died on 14 December 1948 at age 86. [S246] U.S. Federal Census 1880 U.S. Federal Census, by Ancestry.com, NA Film Number T9-0680 Page Number 210C. Walter Tanner Crotchett was born on 3 February 1901 at Miami, Kansas. He was the son of William Henry Crotchett and Martha Ann Staley. Walter Tanner Crotchett married Mary Kathryn Winters on 28 September 1926 at Paola, Miami, Kansas. He died in October 1973 at age 72. Walter Tanner Crotchett obtained US Social Security Card at Kansas; Last residence Louisburg, Miami, Kansas. Name Variation William Hagy Crotchett was also known as Hagar. William Hagy Crotchett was born on 7 July 1903 at Miami, Kansas. William Hagy Crotchett married Mildred Rose Wells, daughter of Mark Wells and Mary J (? ), on 3 October 1925 at Louisburg, Miami, Kansas. He died in October 1973 at age 70. William Hagy Crotchett obtained US Social Security Card at Kansas; Last residence Shawnee Mission, Johnson, Kansas. [S250] U.S. Federal Census 1930 U.S. Federal Census, by Ancestry.com, ED61-24. Dwelling 8. Married Name 8 October 1876 As of 8 October 1876,her married name was Crotchett. Sarah Elizabeth McKee was born in March 1854 at Illinois also reported as Virginia. 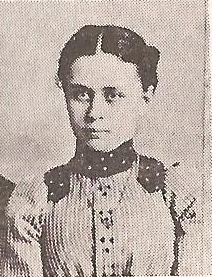 Sarah Elizabeth McKee married John Wesley Crotchett, son of Lorenzo Dow Crotchett and Elizabeth Christian Tanner, on 8 October 1876 at Paola, Kansas. Sarah Elizabeth McKee, as the mother of the bride, attended the wedding of George E. Maisel and Elsie Deane Crotchett on 12 April 1914 at bride's parents house, Deming, Luna, New Mexico; Elsie Crotchett and George Maisel marriage announcement. Sarah Elizabeth McKee died on 12 February 1919 at San Diego, California, at age 64 Mrs J W Crotchett (Sarah McKee) obituary. She was buried after 12 February 1919 at Desert Lawn Memorial Gardens, Deming, Luna, New Mexico. 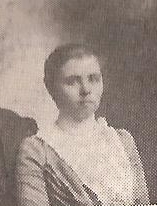 1 March 1905 Wea, Miami, Kansas Sarah Elizabeth McKee appeared on the census of 1 March 1905 in the household of John Wesley Crotchett at Wea, Miami, Kansas; living next door to G. W. Combs. Sarah Elizabeth McKee had 10 with 8 living in 1910 children. In November 1963 at Deming, Luna, New Mexico, named in John Wesley Crotchett family heirship legal filing. Adrian Wesley Crotchett was born on 7 February 1882 at Louisburg, Wea, Miami, Kansas, also reported as 2 Feb 1883 and 07 Feb 1881 and 07 Feb 1880. He was the son of John Wesley Crotchett and Sarah Elizabeth McKee. 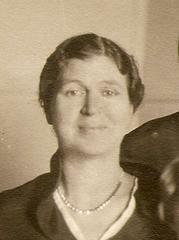 Adrian Wesley Crotchett married Marie T. Cutright on 3 January 1927 at Clark, Ohio. Adrian Wesley Crotchett died on 9 July 1943 at Franklin, Ohio, at age 61. Adrian Wesley Crotchett had zero children. He was a marble setter for a building in 1910. On 12 September 1918 at 98 North Grant, Columbus, Franklin, Ohio, self employed marble cutter; nearest relative is Maud Crotchett (wife). He was a marble polisher in 1925 at Columbus, Franklin, Ohio. In November 1963 at Deming, Luna, New Mexico, named in John Wesley Crotchett family heirship legal filing. [S226] Kansas, Marriage Records Leavenworth county Marriage Records, by Kansas, Book O, Page 477. FHL LCGS: 1854769/106. [S244] U.S. Federal Census 1910 U.S. Federal Census, by Ancestry.com, Year: 1910; Census Place: Chicago Ward 23, Cook, Illinois; Roll: T624_266; Page: 13B; Enumeration District: 0980; FHL microfilm: 1374279. [S243] U.S. Federal Census 1920 U.S. Federal Census, by Ancestry.com, Year: 1920; Census Place: Columbus Ward 8, Franklin, Ohio; Roll: T625_1382; Page: 2B; Enumeration District: 140. [S250] U.S. Federal Census 1930 U.S. Federal Census, by Ancestry.com, ED25-181. Dwelling 119. Name Variation Leslie Bryan Crotchett was also known as L. B. Name Variation Leslie Bryan Crotchett was also known as Les. Nickname Leslie Bryan Crotchett also went by the name of Less. 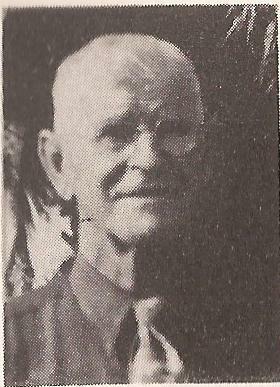 Leslie Bryan Crotchett was born on 3 September 1882 at Louisburg, Wea, Miami, Kansas. Leslie Bryan Crotchett married Henrietta Thomas, daughter of John Thomas and Sarah (? ), on 24 February 1904 at Kansas City, Missouri. Leslie Bryan Crotchett died on 26 April 1966 at Hoxie, Sheridan, Kansas, at age 83 Leslie B. Crotchett, son of Mr. and Mrs John Wesley Crotchett, was born Sept. 3, 1882 at Louisburg, Kansas and departed this life on Tuesday, April 26 at the Sheridan County Hospital. He was united in marriage to Etta Thomas on Feb. 24, 1904 at Kansas City, Mo. To this union four daughters were born: Alice Miller of Colby; Lenora Blair of Norton; Stella Duff of Alton, and Dorothy Lovin of Hoxie. The Crotchetts lived at Louisburg until December, 1907 when they moved to Sheridan County, Kansas and lived on a farm until he moved to Hoxie in 1963 where he lived at the hotel until entering the Long Term Care Unit in December, 1964. He was preceded in death by his wife on Nov. 3, 1933; his parents and three brothers, Clarence, Albert and Adrian and sister Stella. He leaves to mourn his passing his four daughters; nineteen grandchildren, thirty-six great grandchildren, seven step grandchildren and one foster great granddaughter; four brothers: Clyde and Noah of California; Harvey of Chicago, Ill., Allen of Deming, N.M., and one sister, Elsie Maisel of Stayton, Ore; also a host of other relatives and friends. Funeral services were held Saturday, April 30 at 2 p.m. at the Hoxie Methodist Church with Rev. E. C. Wood officiating. Burial was at the Hoxie Cemetery. He was buried after 26 April 1966 at Hoxie Cemetery, Hoxie, Sheridan, Kansas. Leslie Bryan Crotchett obtained US Social Security Card at Kansas; Last residence Hoxie, Sheridan, Kansas. In November 1963 at Deming, Luna, New Mexico, named in John Wesley Crotchett family heirship legal filing. [S243] U.S. Federal Census 1920 U.S. Federal Census, by Ancestry.com, ED200. Dwelling 62. [S250] U.S. Federal Census 1930 U.S. Federal Census, by Ancestry.com, ED90-13. Dwelling 23. Harvey Rude Crotchett was born on 23 October 1883 at Louisburg, Wea, Miami, Kansas. Harvey Rude Crotchett was married zero times. He obtained US Social Security Card at Illinois; Last residence Loma Linda, San Bernardino, California. In November 1963 at Deming, Luna, New Mexico, named in John Wesley Crotchett family heirship legal filing. Clyde Emerson Crotchett was born on 28 April 1885 at Louisburg, Wea, Miami, Kansas. Clyde Emerson Crotchett witnessed the death of Sarah Elizabeth McKee on 12 February 1919 at San Diego, California; Mrs J W Crotchett (Sarah McKee) obituary. He was buried after 9 December 1978 at Grand View Memorial Park and Crematory, Glendale, Los Angeles, California. 1 March 1905 Wea, Miami, Kansas Clyde Emerson Crotchett appeared on the census of 1 March 1905 in the household of John Wesley Crotchett at Wea, Miami, Kansas; living next door to G. W. Combs. Clyde Emerson Crotchett obtained US Social Security Card at California; Last residence Loma Linda, San Bernardino, California. In November 1963 at Deming, Luna, New Mexico, named in John Wesley Crotchett family heirship legal filing. Name Variation Perry Allen Crotchett was also known as Alan. Name Variation Perry Allen Crotchett was also known as Allen Perry. Perry Allen Crotchett was born on 6 December 1886 at Louisburg, Wea, Miami, Kansas. 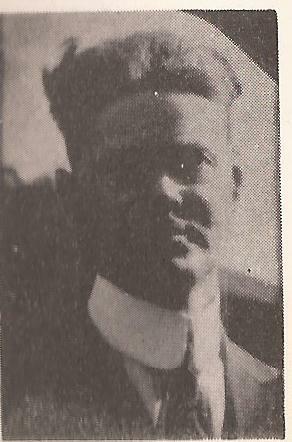 Perry Allen Crotchett married Myrtle Emily Dixon, daughter of Tom H. Dixon and Hariet Jones, on 12 June 1918 at El Paso, Texas. He was buried after 13 August 1976 at Mountain View Cemetery, Deming, Luna, New Mexico. 1 March 1905 Wea, Miami, Kansas Perry Allen Crotchett appeared on the census of 1 March 1905 in the household of John Wesley Crotchett at Wea, Miami, Kansas; living next door to G. W. Combs. Perry Allen Crotchett obtained US Social Security Card at New Mexico; Last residence Deming, Luna, New Mexico. 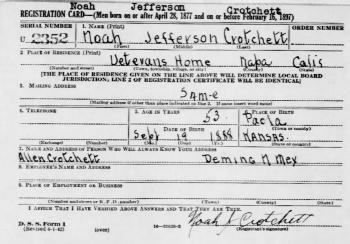 In 1942 at WWII Registration Card, California, listed as contact for Noah Jefferson Crotchett. In January 1957 Allen Crotchett, local mail carrier, retires after 41 years of service. He was buried after 31 May 1980 at Mountain View Cemetery, Deming, Luna, New Mexico. 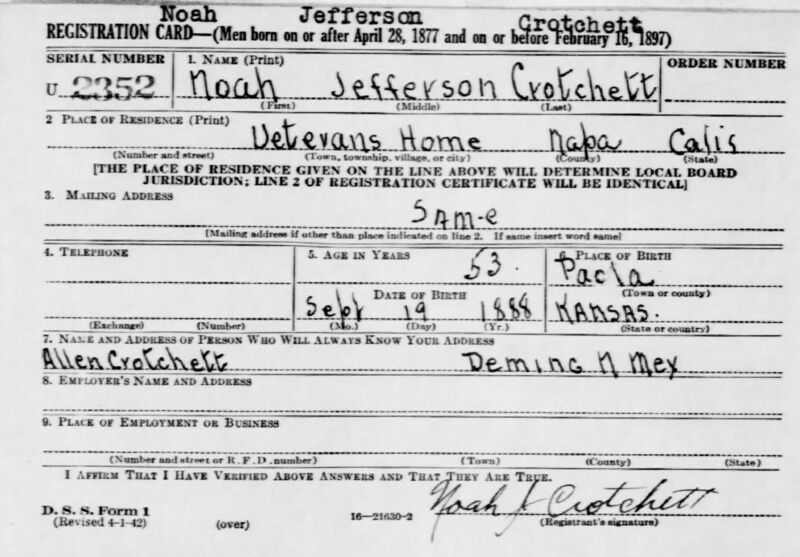 1 March 1905 Wea, Miami, Kansas Noah Jefferson Crotchett appeared on the census of 1 March 1905 in the household of John Wesley Crotchett at Wea, Miami, Kansas; living next door to G. W. Combs. Noah Jefferson Crotchett obtained US Social Security Card at California; Last residence Yountville, Napa, California. In 1942 at WWII Registration Card, California. In 1942 Noah is unmarried. He lives in the Veteran's Home in Napa County, California.6 In November 1963 at Deming, Luna, New Mexico, named in John Wesley Crotchett family heirship legal filing. [S243] U.S. Federal Census 1920 U.S. Federal Census, by Ancestry.com, Voting precinct #33. ED 84. [S250] U.S. Federal Census 1930 U.S. Federal Census, by Ancestry.com, ED38-369. Morrilton, Genealogy Crotchett --- Tanner, pg 28. Married Name 1 March 1917 As of 1 March 1917,her married name was Dixon. Stella Mable Crotchett was born on 12 September 1890 at Louisburg, Wea, Miami, Kansas. She was the daughter of John Wesley Crotchett and Sarah Elizabeth McKee. 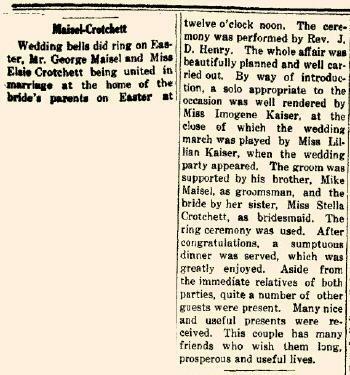 Stella Mable Crotchett was a bridesmaid at the wedding of George E. Maisel and Elsie Deane Crotchett on 12 April 1914 at bride's parents house, Deming, Luna, New Mexico; Elsie Crotchett and George Maisel marriage announcement. Stella Mable Crotchett married Nelson Jones Dixon, son of Tom H. Dixon and Hariet Jones, on 1 March 1917 at Deming, Luna, New Mexico. Stella Mable Crotchett died on 3 July 1953 at El Paso, Texas, at age 62 Stella (Crotchett) Dixon obituary. She was buried after 3 July 1953 at Mountain View Cemetery, Deming, Luna, New Mexico. 1 March 1905 Wea, Miami, Kansas Stella Mable Crotchett appeared on the census of 1 March 1905 in the household of John Wesley Crotchett at Wea, Miami, Kansas; living next door to G. W. Combs. 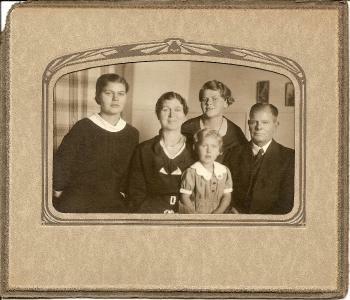 Nelson Jones Dixon and Stella Mable Crotchett Family. [S250] U.S. Federal Census 1930 U.S. Federal Census, by Ancestry.com, ED15-2. Dwelling 1. Name Variation Elsie Deane Crotchett was also known as Elcie. Married Name 12 April 1914 As of 12 April 1914,her married name was Maisel. 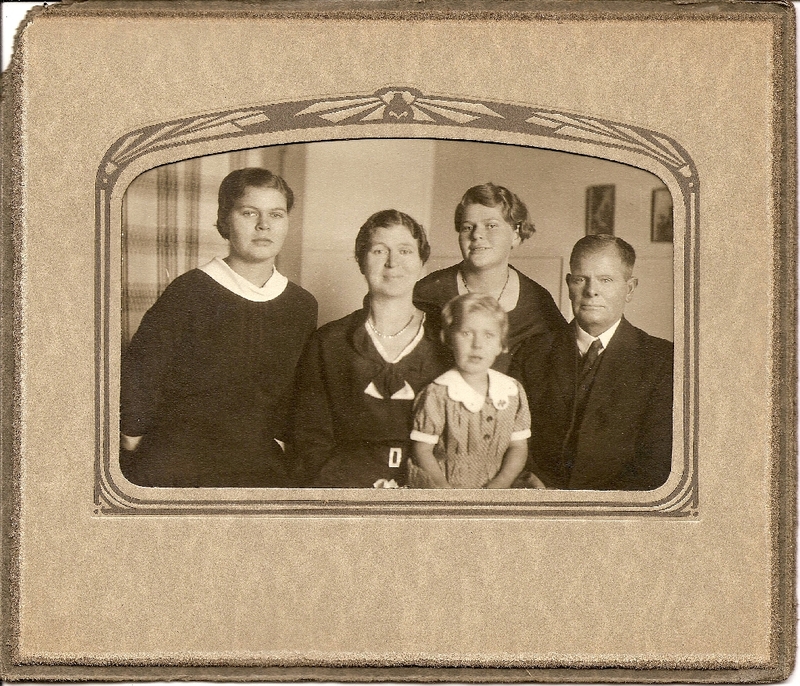 Elsie Deane Crotchett was born on 21 May 1892 at Louisburg, Wea, Miami, Kansas. Elsie Deane Crotchett married George E. Maisel, son of George R. Maisel and Regina (? ), on 12 April 1914 at bride's parents house, Deming, Luna, New Mexico, Elsie Crotchett and George Maisel marriage announcement. Elsie Deane Crotchett was buried in February 1985 at Lone Oak Cemetery, Stayton, Marion, Oregon. She died in February 1985 at age 92. 1 March 1905 Wea, Miami, Kansas Elsie Deane Crotchett appeared on the census of 1 March 1905 in the household of John Wesley Crotchett at Wea, Miami, Kansas; living next door to G. W. Combs. Elsie Deane Crotchett obtained US Social Security Card at Oregon; last residence Stayton, Marion, Oregon. In November 1963 at Deming, Luna, New Mexico, named in John Wesley Crotchett family heirship legal filing. [S244] U.S. Federal Census 1910 U.S. Federal Census, by Ancestry.com, ED 143. Stemp 239. Dwelling 374 supplemental. [S243] U.S. Federal Census 1920 U.S. Federal Census, by Ancestry.com, ED73. Dwelling 70. [S250] U.S. Federal Census 1930 U.S. Federal Census, by Ancestry.com, ED24-25. Dwelling 50. Married Name 11 September 1900 As of 11 September 1900,her married name was Smith. Lora Ellen Crotchett was born on 10 December 1878 at Miami, Kansas. She was the daughter of William Henry Crotchett and Mary Jane Morrow. 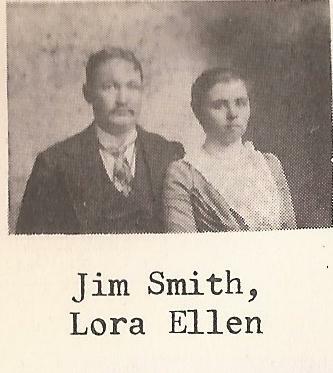 Lora Ellen Crotchett married James S. Smith on 11 September 1900. Lora Ellen Crotchett died on 5 January 1939 at California at age 60. Lora Ellen Crotchett had zero children. She migrated at New Mexico. She migrated at California. Name Variation William Luther Crotchett was also known as W. L.
Name Variation William Luther Crotchett was also known as Luther William. William Luther Crotchett was born on 22 June 1880 at Miami, Kansas. He was the son of William Henry Crotchett and Mary Jane Morrow. William Luther Crotchett married Hester B. Gaul, daughter of William Gaul and Emma G. (? ), on 23 October 1900 at at the Gaul home near, Louisburg, Wea, Miami, Kansas. William Luther Crotchett died on 17 August 1962 at Louisburg, Miami, Kansas, at age 82. 1 March 1905 Wea, Miami, Kansas William Luther Crotchett appeared on the census of 1 March 1905 at Wea, Miami, Kansas. Married Name circa 1901 As of circa 1901,her married name was Masterson. Tica Dema Crotchett was born on 17 May 1882 at Miami, Kansas. 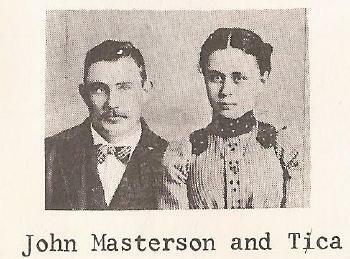 Tica Dema Crotchett married John N. Masterson, son of Thomas Masterson and Emily (? ), circa 1901. Tica Dema Crotchett died in January 1969 at age 86. Tica Dema Crotchett obtained US Social Security Card at Missouri; last residence Kansas City, Jackson, Missouri. [S243] U.S. Federal Census 1920 U.S. Federal Census, by Ancestry.com, Stamp 125. Dwelling 12. ED47. Sheet 8A. [S250] U.S. Federal Census 1930 U.S. Federal Census, by Ancestry.com, ED19-29. Dwelling 17. Name Variation Leon Dow Crotchett was also known as L. D.
Leon Dow Crotchett was born on 9 May 1890 at Miami, Kansas, twin with Liela who died at birth. He was the son of Thomas Jefferson Crotchett and Bell Carrie Schoonover. Leon Dow Crotchett married Mary S. Walker circa 1910 at Miami, Kansas. Leon Dow Crotchett married Mary (?) 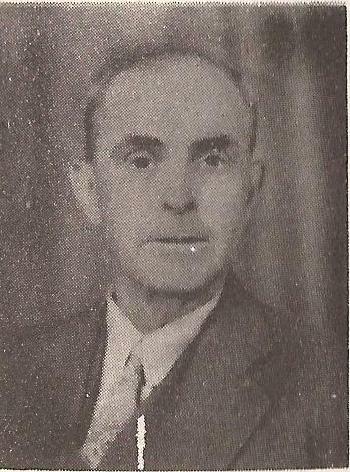 circa 1929. Leon Dow Crotchett married Mary S. Walker after 1930 After having a son, L.D. with second wife Mary, he remarried to Mary Crotchett (his first wife). They live in Harlingen, Texas. Leon Dow Crotchett died in August 1981 at age 91. Leon Dow Crotchett obtained US Social Security Card at Texas; last residence Harlingen, Cameron, Texas. [S250] U.S. Federal Census 1930 U.S. Federal Census, by Ancestry.com, ED31-32. Dwelling 75.